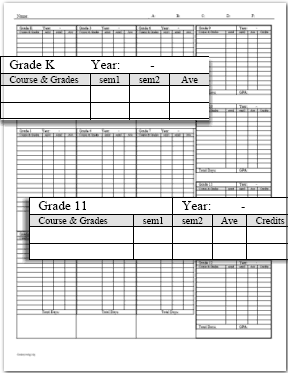 With this file keep a record of your child's subjects or courses, semester grade averages, final grade averages, school attendance, and credits. Grades K-12 - This file is also available on the Grades web page. This file is available to you in three formats: DOC, RTF, and PDF. 1. Choose a format, if the DOC or RTF opens for you that is great, save it to your computer. If using the PDF, print a copy. 2. Add your child's name and grade scale to the record or leave grade scale blank so it will be blank for next year as well. 3. Fill in the name, year, and subjects. 4. Come back to the file when you have semester averages to add. 5. At the end of the year, add the average grade for each subject/course and number of days attended. 6. Make a copy for next year's planner. 7. If grade scale is blank, add it at this time and file current year's original copy.